For travelers, Seattle does double duty as a sophisticated city break and dramatic escape to nature. Expect busy days exploring the city’s revamped downtown, family-favorite waterfront, and coffee shops galore, and don’t miss a day trip to the Olympic National Park. And where to rest your weary head? We asked insider Brandi Wilson to share her favorite hotels across the city, from a waterfront classic families love to a new hotspot with a knockout rooftop bar. With a plum location above Elliot Bay on the edge of Pike Place Market, a heated infinity pool with cabana service, a chic marble spa, and its very own coffee concierge service (only in Seattle! ), the Four Seasons is an enduring favorite worthy of its Forbes 5-star rating. Rooms are fresh and updated in keeping with the FS brand, if not particularly innovative in style, though the new marble bathrooms with TVs in the mirrors are pretty fabulous. Kids are well accommodated with a rollaway bed or connecting rooms in most configurations, and Elliot Bay Suites have pull-out sofa beds. Avoid rooms overlooking the pool (unless direct access for kids outweighs potential noise annoyance) and book Elliot Bay views if possible – the Corner Suites snag the best scenery. Passported Perks! Daily breakfast for 2 + $100 food and beverage credit. 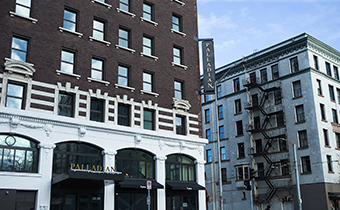 On the edge of Belltown, just a short walk from Pike Place Market, the Palladian has been a popular style steal since opening in 2015. With a baroque-apothecary edge, the quirky oil paintings and throw pillows featuring local pop culture icons reimagined as Napoleon generals gave it immediate cult status. 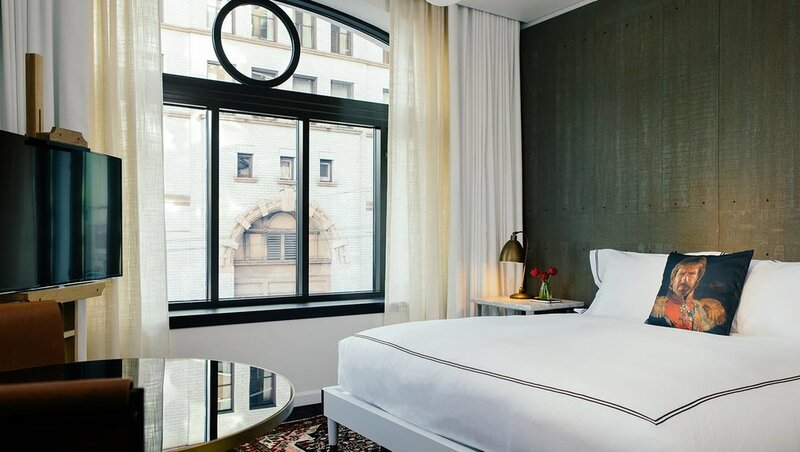 Rooms have a cozy rock star vibe that will be familiar to Ace hotel fans, with reclaimed wood walls and rich black and brass bathrooms featuring claw foots or walk-in glass showers. One-bedroom suites have separate living rooms with pull out sofa beds. The dark lobby is on the small side, but attached bar Pennyroyal gets high marks as an all-day hangout for both your morning espresso and evening cocktails. By contrast, the modern comfort seafood restaurant, Shaker and Spear, is bright and airy and feels more LA than Seattle. Standard touches like complimentary bicycles, daily wine hours and locally sourced mini bars round out the experience. 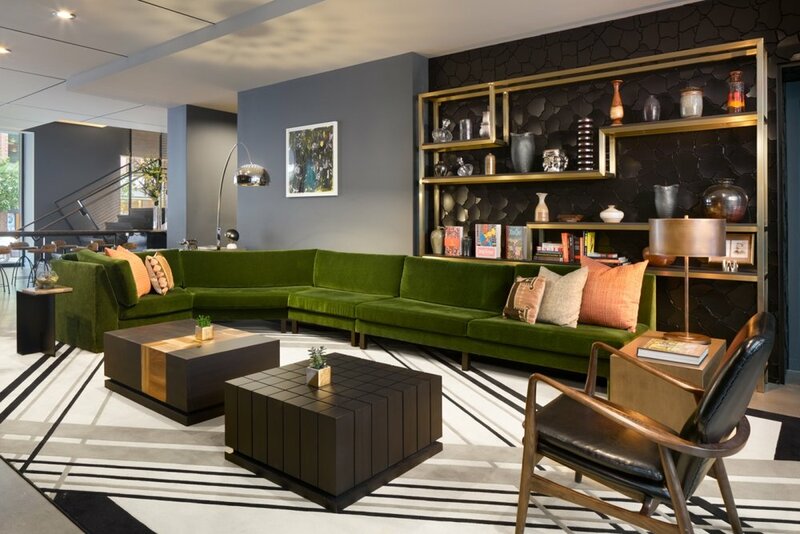 When Kimpton gets it right, the design can truly elevate the brand, and this is a great example. A firm family favorite, the Edgewater Hotel has a real over-water location, Disney-ish forest lodge vibe, thoughtful touches like teddy bears on beds and rubber ducks in the bath, and proximity to the Aquarium and the Seattle Great Wheel. Back in the day, guests used to be given fishing poles at check-in to try their hand at a daily catch from out their windows. Nowadays, ogling the view from your patio in a Waterfront Room or suite facing Elliot Bay and the Olympic mountains is as close as you’ll get to interact with the scenery, but the proximity is still pretty epic. With over 200 rooms, there are plenty of connecting options for families, but we prefer those with a water view. Don’t miss a brunch of Marionberry pancakes and Dungeness crab Benedict at waterfront restaurant Six Seven—just book in advance to beat the crowds of tourists from the nearby cruise ship terminal. Also good to know: the lobby is undergoing a revamp until late 2017. This lodge retreat minutes from SeaTac Airport is perfect for Seattle stopovers. Book a spa treatment at the beautiful wellness center, dine on the farm-to-table fare in Copperleaf Restaurant, or just wander among the koi ponds in the 18-acre grounds. Only the whir of planes overhead outside interrupts the peace. Rooms are comfortable and cozy, with a touch of Northwest flair. All suites have Queen sofa beds in separate living rooms, and Olympic Suites have dining rooms with freestanding double fireplaces and outdoor decks. Half of the rooms face the parking lot, so always request garden views and the new Alder building, which has updated walk-in showers rather than shower/tub combos. There are communal guest living rooms in each of the three buildings, all with gas fireplaces, TVs and kitchens stocked with Haagen-Dazs for late night cravings. A complimentary breakfast buffet (take it outside on the deck if the weather is nice), a pillow selection, and a complimentary bath salt bar for guests in the spa round out the perks.